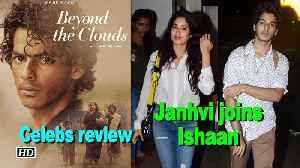 newsR > Lifestyle News > Janhvi Kapoor, Ishaan Khatter&#039;s &#039;Dhadak&#039; picture calls for a frame! Janhvi Kapoor, Ishaan Khatter&#039;s &#039;Dhadak&#039; picture calls for a frame! Isn't the picture giving solid friendship goals? #JanhviKapoor and #IshaanKhatter surely were having a blast dancing to Zingaat from Dhadak at Filmfare's celebration in Oman! Check out their amazing chemistry in this video.